Well I guess it began towards the end of 1996 when I received a call from [head of Magna Carta Records] Pete Morticelli and [head of Shrapnel Records] Mike Varney who wanted to put together a couple of “Super Groups” (for lack of a better term!). One turned into the Black Light Syndrome project with [Frank Zappa drummer] Terry Bozzio and they asked me if I’d like to help construct the other…. So… They asked me to compile a “Wish List” of all the musicians I’ve always wanted to work with. With Frank Zappa and John Lennon no longer being options, I came up with some other names. 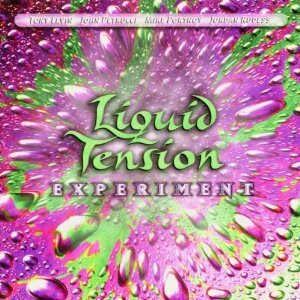 These words were taken from the liner notes of the self-titled debut album by Liquid Tension Experiment, whose eventual lineup consisted of drummer Mike Portnoy (the author of the notes), bassist Tony Levin, guitarist John Petrucci, and Jordan Rudess on keys. With no clear frontman and no vocalist in sight, this all-star prog rock dream team laid down some of the most fluid, engaging, virtuosic instrumentals ever unleashed. They will be remembered as Mike Portnoy’s second-best supergroup. Before the turn of the century, in fact, Portnoy worked with multi-instrumentalist Neal Morse to assemble Transatlantic: the contemporary equivalent of Asia, the grown-up future selves of A Perfect Circle, the prog rock version of… I don’t know, Chickenfoot. Let me introduce the cast. Mike Portnoy of Dream Theater is the premier living prog metal drummer. What he lacks in jazz chops – and I say “lacks” only relative to the absolute greats – he proves unimportant through the inimitable crossover success of his primary project. Neal Morse, now a solo Christian artist with a string of religious concept albums under his belt, rose to international fame as the mastermind behind Spock’s Beard, America’s answer to Genesis, founded in the 1990’s. Roine Stolt, Sweden’s gift to prog, has achieved greatness foremost with The Flower Kings with his songwriting and lyrical prowess. His work on guitar, no less, brings to mind a young Steve Howe. Pete Trewavas has played bass for Marillion ever since Fish was there… which is a statement I encourage you to investigate on your own if its gravity is lost on you. These accolades are leading somewhere, I assure you. 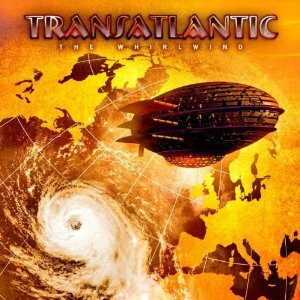 Transatlantic congregated for a week or two to throw together a brilliant masterpiece in each 2000 and 2001. Almost a decade later, these musical giants of our day have graced us with one more taste of teamwork, entitled The Whirlwind. As we should expect, Transatlantic used up just about every second of the 80 minutes a mass-produced cd can hold, filling that space with one continuous piece of music demarcated into twelve thematic tracks. All four guys bring their own sounds to the table and everybody can be heard singing lead at some point or another. A seven-minute instrumental overture gives way to the bookend motif “Whirlwind,” which lyrically sets the stage for tales of life’s oppressive confusion and how we can overcome it. Soon after, “On the Prowl” lays down the sickest jam you ever did hear. Killer drum licks pair with a genius jazz bassline to hold the ground while Stolt’s guitar and Morse’s keys take to the sky, cruising through a wild array of styles and rhythms with adept elegance. That solo session stands as a clinic on how to show off technical ability while remaining genuinely melodic and engaging, all off the top of your head. Expansive vocal harmonies draw your attention in “Out of the Night” while the striking guitar commands your toes to tap. It is one of many tunes to evidently showcase team songwriting – in fact, this is true of every song on the disc. Influences from Spock’s Beard and The Flower Kings take turns directing the overarching mood of each passage while Trewavas and Portnoy invent whatever ideal companion of an undercurrent they’d like to produce at any given time. In truth, there isn’t much Dream Theater to be heard here. Portnoy’s brand of rock is an outlier next to relative poppiness around him in Transatlantic. However, in “Is This Really Happening?”, the metal beast is freed and a sonic onslaught of punishing rolls and blast beats coerces Stolt into some serious dark shredding. Only one standalone instrumental was written for the album, “Pieces of Heaven,” and though it is shorter than one might have expected, each of the other songs contains a host of solos and constructed melodies enacted sans vocals. Just before the reprise of the bookend motif, Neal Morse slips in some of his least obscured religious undertones in “Dancing with Eternal Glory.” That man is a singing preacher at heart who has no reserves about his evangelical calling. The Whirlwind closes with every bit of grand majesty becoming of a progressive concept album. If anything, I was surprised that equal magnificence and pomp did not decorate the first few minutes of the overture, but the greatest swell was saved for last. So as to provide some small facade of objectivism, let me critique the performance of all four musicians on this album in the department of vocal performance. Neither Stolt nor Morse, who split the major part of the singing duties, will ever win an award for having a pretty voice. Certainly both are capable, but with unspectacular ranges and what some might call an elderly tremolo to their sound. Trewavas and Portnoy are nothing if not unremarkable vocally. The music in The Whirlwind is at times technically extreme and often improvised or elaborated. What will be far more salient to non-proggers is that the songs are long and, from a mainstream standpoint, circuitous. Verses and choruses together make up only half of the 80 minutes, a fact which can leave unfocused listeners feeling lost. This is all a matter of the target audience: some people find Transatlantic cumbersome in style while others see them as monoliths of ability. Fortunately, those who have cause to stumble upon the group tend to fall into the latter set. Mike Portnoy’s “Wish List” of musicians didn’t include a single vocalist. Yet a couple of years down the road he and Pete Trewavas joined two frontmen to form a powerhouse collective of prog’s most famous standard bearers into the new millenium. Any predictions for who will be part of his next collaboration? ← Shutter Island: Live as a monster or die as a good man? Brian Terrill's 100 Film Favorites - #17: "Toy Story 2"